(PRESS RELEASE) PARADISE VALLEY, AZ – The Hermosa Inn, a AAA Four Diamond hotel nestled in the heart of Paradise Valley, offers plenty of options to unwind and dine at this boutique hideaway of 43 luxury casitas, which was ranked as #9 of the Top 10 Hotels in the U.S. and the #1 Hotel in the Southwest & West in Condé Nast Traveler’s 2017 Readers’ Choice Awards. Book early and receive a double bonus: $50 in daily Food & Beverage credit and 4 drink tickets upon arrival during the exclusive pre-sale week: April 8th – April 14th. Luxuriate poolside in comfortable cabanas, available from 8:00 a.m. to sunset and toast the day with either a bucket of Arizona canned beers with house-made guacamole, chips and salsa, or a carafe of Sangria of the Day, served with a seasonal fruit and cheese platter. Cabana rentals are $75 per day and reservations are required. For snacking and sipping poolside, choose from signature sandwiches, salads or wood-fired pizzas to be enjoyed with the hotel’s signature crushed cocktails cleverly served in a plastic pouch. A refreshing selection includes the Parisian Rosé, an intoxicating blend of rose wine, luxardo maraschino cherry liqueur, pomegranate syrup and fresh lemon juice served over crushed ice. The return of 100+ degree temperatures in the greater Phoenix area also ushers in a cool reprieve in the form of a one-of-a-kind culinary experience in the underground wine cellar at LON’s at the Hermosa. Beginning May 30th through September 15th, the hotel's signature restaurant will open its private subterranean wine cellar to offer guests and Valley residents alike a special five-course tasting menu ($69++/person) along with a wine pairing option (additional $35/person). Cool (in every sense of the word), the cellar – kept at 57 degrees – is normally available only for private events, but will now be open for parties of two or more, Thursday through Sunday nights, but it can only be reserved within 7 days and by calling LON’s at 602.955.7878. $49 THREE-COURSE SUMMER PRIX-FIXE MENU: Executive Chef Jeremy Pacheco will be creating a tantalizing and ever-changing three-course prix-fixe menu for $49 at LON's that will be offered May 31st through September 15h. HACIENDA BRUNCH FOR TWO: : With a wide-ranging menu including Lobster Tempura, three variations of Eggs Benedict, Huevos Rancheros and the popular Shrimp & Blue Crab “Louie” salad, LON’s is the ideal locale for a leisurely Saturday or Sunday Brunch, from 10 a.m. – 2 p.m. Saturday brunch sparkles even brighter with a complimentary glass of bubbly with the purchase of an entrée or salad. For just $34 per person, the Hacienda Brunch for Two features a shared starter (choice of the House Smoked Salmon served atop a crispy potato cake; Avocado Toast with Abby Lee tomatoes and grilled Noble bread; or the House-Made Peppered Bacon served sizzling on a cast iron skillet with Noble bread, maple syrup, and late harvest vinegar), choice of two entrees or salads and two featured boozy beverages. The brunch cocktail menu offers a range of colorful and refreshing Margs, ‘Mosas & Mules, which can be customized with blood orange, kiwi, pineapple, black cherry or white peach puree. The perfect summer sipper, the White Sangria, is an effervescent blend of prosecco, St. Germain and peach puree. Red or yellow Marys (chipotle/tomato or horseradish/yellow tomato) are show-stoppers created with one of two infused AZ Mission vodkas and fresh tomato juice, garnished with pickled sweet peppers. LON’S LAST DROP EXTENDED HAPPY HOUR: From Memorial Day through Labor Day, LON’s Last Drop celebrates summer with happy hour pricing from 4 p.m. to close, with reduced pricing on Arizona craft canned beer, wines on tap and draft cocktails, plus half-priced bar snacks. Perfect for sharing, Carafe & Cellar is an incredible value for just $28, which boasts a board of artisan meats and cheeses ‘from the cellar’ accompanied by house-made pickles, grilled Noble bread and a carafe of draft wine. LON’s LAST DROP BBQ BOARD FOR TWO: Savor the flavors of summer with a bountiful BBQ Board for two, offered exclusively in LON’s Last Drop, from May 28th through September 3rd. The board will feature a hearty rotation of house smoked favorites; such as pulled pork sliders, house smoked baby back ribs and sausages, plus side salads and more, for just $36. For $18, add a carafe of draft wine or a growler of draft beer for a great dining deal. ABOUT THE HERMOSA INN, LON’S & LON’S LAST DROP: Ranked as #9 of the Top 10 Hotels in the U.S. and the #1 Hotel in the Southwest & West in Condé Nast Traveler’s 2017 Readers’ Choice Awards, the AAA Four Diamond Hermosa Inn is a jewel of a hideaway surrounded by an exclusive neighborhood in Paradise Valley, and just minutes from Scottsdale and its many attractions. Handcrafted in the 1930's by cowboy artist Lon Megargee as his residence and art studio, the Inn’s adobe architecture has maintained its “authentic Arizona” character and charm. The 43 newly renovated guest casitas are nestled in a garden setting with breathtaking vistas of the lush desert and Camelback Mountain. Accommodations reflect the southwestern design of the original Casa Hermosa (beautiful house) and most include deep soaking tubs, beehive fireplaces and private patios. The culinary centerpiece is LON’s at the Hermosa, a AAA Four Diamond restaurant honored by Food & Wine magazine as Arizona's Most Romantic Restaurant, serving globally inspired Arizona fare. A recipient of Wine Spectator's 'Best of Award of Excellence', the restaurant is complemented by a subterranean wine cellar, a celebrated outdoor dining patio, and its bar and casual dining counterpart, LON’s Last Drop, named after one of Megargee’s iconic paintings, many of which are displayed throughout the resort. For more information, visit HermosaInn.com or call 602.955.8614. To become a fan, visit us on Facebook at www.facebook/HermosaInn, follow us on Twitter at www.twitter.com/HermosaInn or share with us on Instagram at www.instagram.com/HermosaInn. The Hermosa Inn is located at 5532 Palo Cristi Road, Paradise Valley, Arizona 85253. (PRESS RELEASE) - It was with a heavy heart this past October that Peter Kasperski, former owner of Kazimierz Wine Bar, said goodbye and closed the doors of his iconic bar after 15 years. In wanting to keep the tradition alive, Scottsdale Restaurateur Tommy Plato announced he has acquired the Kazimierz space on Stetson Drive and plans to re-open Kazimierz under the name Kazimierz Wine and Whiskey Bar on Thursday, January 24th at 4pm. Plato, who currently owns The Second Story Liquor Bar says his Kazimierz Wine and Whiskey Bar will offer a similar ambiance but with a new vibe and updated space that includes new furniture, paint and décor. Plato has also added new exclusive VIP seating and a Whiskey Bottle Keep program where guests can store their high-end whiskey in lockers and other exclusive perks. Guests can also enjoy Happy Hour from 4pm to 7pm every day and the full menu will be available until close every night. Additionally, Plato plans to introduce a new chef and menu, as well as a new Whiskey Ambassador program and LIVE music nightly. Legendary Jazz musician Dennis Rowland and Diana Lee will perform on opening night with other impressive acts to follow. “Peter was a pioneer in Old Town and what he created here with Kazimierz in this space is exactly what Scottsdale needs,” said Tommy Plato. “I’m excited to keep this tradition alive but with an updated twist on a high-end establishment where you can go to have after-dinner drinks, light bites and great live music all night long in an upscale environment that caters to wine and cocktail enthusiasts,” said Plato. Plato, who founded the highly successful Gelato Spot and Second Story Liquor Bar, calls Kazimierz the perfect synergy for what he does best. He will using local purveyors featuring Noble Bread and Chula Seafood. Among the new food offerings are Plato’s signature Biscuits, Charcuterie and Fromage plates, Bruschetta, Oysters, Flatbreads and more! Plato’s background with Gelato Spot will also help him create an elevated dessert program. He plans to offer an elaborate dessert menu each night featuring the seven deadly sins of desserts. 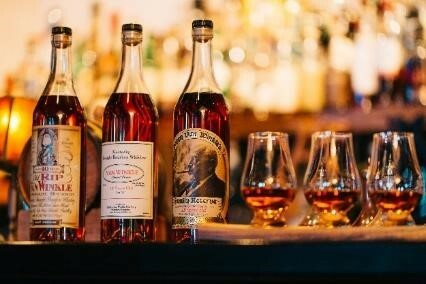 The new experience will eventually offer more than 100 wines and 500 whiskeys including Bourbon, Ryes, American Whiskey, Japanese, and Scotch, in addition to hand-picked vintages from around the world. Kazimierz Wine and Whiskey Bar is located at 7137 E Stetson Dr., Scottsdale, AZ 85251 in Scottsdale. For more information, visit the new website http://www.Kazbarscottsdale.com or call (480) 946-3004.